Gypsy skirt can add great value to your wardrobe. It is made up of colorful fabric containing versatile designs. Moreover, it is extremely comfortable and is considered as one of the most desirable dance costumes. 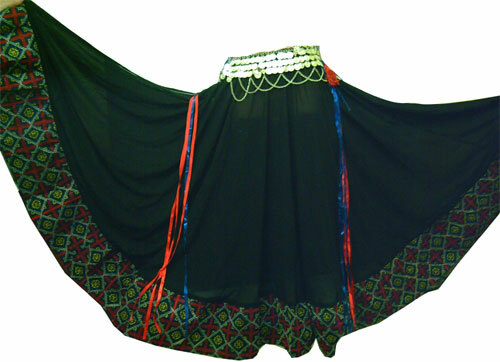 Although, you can easily get a gypsy skirt from the market, making it at home is a lot more fun. All you need is a little time to follow a simple sewing process. First of all, you have to take the measurements of your length, waist and hips. Please note that gypsy skirts generally fall to the ankles. However, you can also make it tall or short if you want. It will be better for you to add at least two inches to the measurement of your waist so that your skirt fits comfortably. Determine the wideness of your tiers. You can either make them according to the measurement you took in step 1 or can increase their width so as to move the skirt down. Now, cut the fabric to make the waistband. Make sure that the strip of the waistband is twice as wide. To make the seams, just add around 1.25 inches to the measurements. After that, you have to cut the piece of fabric to make the interfacing of the waistband. Then, iron the interfacing to first half of the waistband and fold it in half to press the other side. Take the waistband and fold it in half. Then, sew the seam on each side so as to flip the waistband outside-in. Now, you have to cut the rectangles for each tier of the skirt. Cut the top tier so as to make it three times of the waist length. Additionally, the second tier must be 3.25 times the length of the waist while the third tier must be four times. Attach the first tier with the right side by sewing. After that, attach the remaining tiers and make sure they are properly fixed. Attach a one-inch hem right to the bottom of the skirt. Stitch the inner side of the skirt to cover the first tier by hand and add the drawstring. In the end, check all the stitches by wearing the skirt and looking in the mirror.